On many afternoons in suite 100 of NC State’s Witherspoon Student Center, a handful of students sit at tables completing school work on their laptops, while others relax in front of a big-screen television along one wall. But the military uniforms, models and artifacts in a case near the door, and flags displayed around the space, hint at additional activity. Students are just as likely to be meeting with university staff members to discuss Veterans Administration (VA) benefits or the challenge of balancing class schedules with ongoing military service responsibilities. 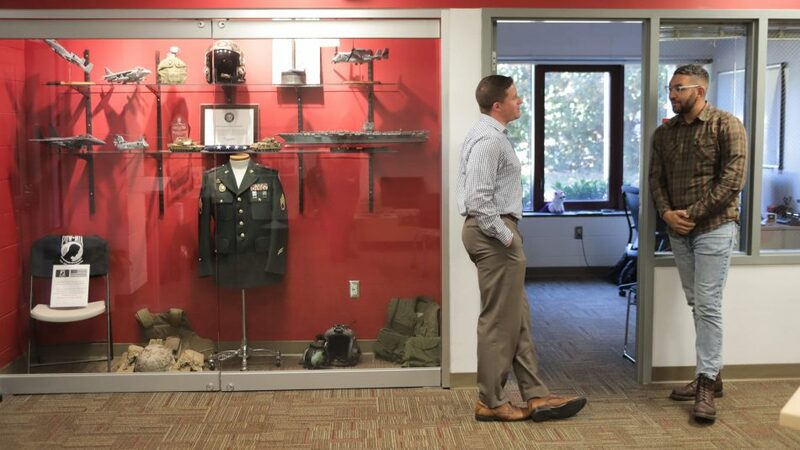 Since November 2016, Military and Veteran Services – part of the Division of Academic and Student Affairs – has been building a one-stop shop in this corner of Witherspoon to link military-affiliated students with support across and beyond campus. “This has really become our space. It has been a great space for me to meet and network with other veterans, and connect with other great resources,” said Dakota Lowery, one of 14 VA work-study students. Lowery, who grew up in Johnston County and served as an infantry officer in the U.S. Army from May 2013 through December 2016, including at Fort Stewart, Georgia, helps oversee a biweekly newsletter focused on the connective efforts. NC State’s military tradition dates to its earliest days, in a state with a large military presence. The university maintains strong Reserve Officer Training Corps (ROTC) programs affiliated with the U.S. Air Force, Army and Navy. It has produced more than 60 generals and flag officers, a figure that trails only service academies and institutions with corps of cadet programs among U.S. colleges and universities. Student Will Beam and Nick Drake meet at the Military and Veteran Services suite at Witherspoon Student Center. In the past few years, many higher-education institutions across the nation have recognized the need and opportunity to provide more formalized support for military-affiliated students. 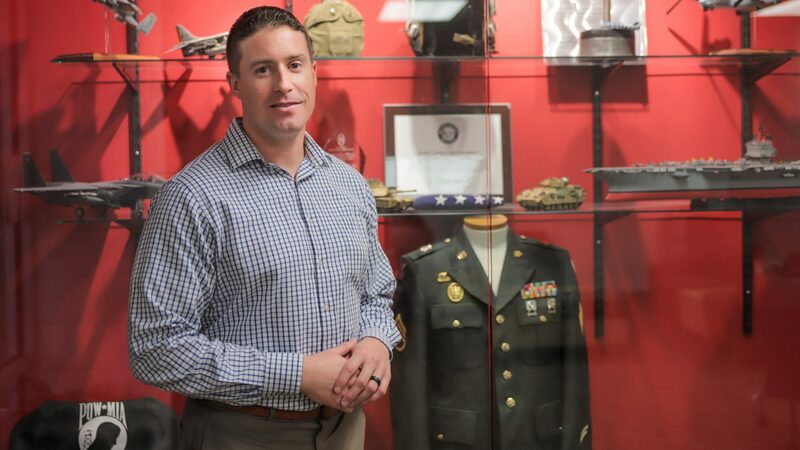 Now, an alumnus and veteran has stepped forward to help further that work at NC State, where the student body includes just under 800 self-identified veterans and almost 1,600 self-identified military dependents. The new Jeffrey D. Wright Veterans Resource Endowment will provide funding toward Military and Veteran Services’ top strategic priorities and needs. These include efforts in recruitment, orientation and transition to college, as well as in student retention and persistence, and alumni and community engagement. Wright, who lives in Bellevue, Washington, earned his B.A. in political science from NC State in 1991 and a commission as an ensign from the university’s Naval ROTC unit. He went on to serve as an officer in the U.S. Navy, 1991-1996. In addition to an initial commitment of $250,000 to the endowment, he has issued a challenge that he hopes will engage other supporters for the Military and Veteran Services Enhancement Fund. Wright will match up to $100,000 of gifts this year. “I have been able to succeed in life not only because of myself, but because NC State had a strong community that was supportive of the military. On any given day, as a student walking across campus, I would see someone in uniform,” Wright said. “On a personal level, I feel like I owe a debt to the university and what it provided me. I also remember my days as a junior officer, when your sole mission was to learn your craft – whatever your job was in the military – but you also had a clear purpose to take care of and support the men and women serving with you. I see this endowment as a way to continue that purpose. Wright grew up in a military family, with a father who has since retired from the Marine Corps, and spent his formative years at Camp Lejeune. The offer of a Naval ROTC scholarship, while not a necessity, helped draw him to NC State, which provided him with a solid foundation for success. In February 2015, he established the Jeffrey D. Wright Scholarship Endowment benefiting Poole College of Management undergraduates with a military affiliation. NC State already has been recognized as an excellent military-friendly university by several organizations, and is committed to that effort, said Nick Drake, director of Military and Veteran Services. But gifts from Wright and other donors will greatly bolster and expand foundational programs, services and reach. Jeffrey Wright, a former officer in the U.S. Navy, is supporting Military and Veteran Services’ recruitment, retention and engagement efforts. Over the past three years, Drake – an Operation Iraqi Freedom veteran with 12 years of military service, and currently a member of the North Carolina National Guard – has led the effort to develop strategic plans, establish best practices, engage with more than 75 campus, community and educational groups, and open the Witherspoon office. 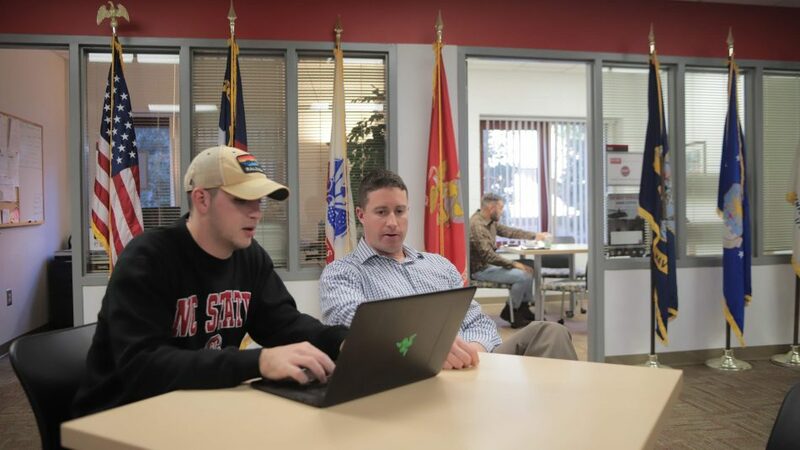 Staff from NC State’s Counseling Center, Disability Resource Office and Career Development Center hold regular office hours in the Military and Veteran Services suite. One Registration and Records staff member, Daniel Hackley, shifted there from Harris Hall to provide ongoing support for several hundred students utilizing GI Bill benefits. Foundational programs already proving successful that Drake hopes to enhance include the Student Veteran Summit, held during the annual Wolfpack Welcome Week at the start of fall semester, and Green Zone Training. That two-hour awareness program for faculty and staff addresses challenges and issues in the military-affiliated community, which skews slightly older than the general student population. In addition to pressures common to all students, challenges can include balancing family commitments and coping with post-traumatic stress disorder. They also can include frustrations such as adjusting to the dynamics of group projects, if other students aren’t as tied to time lines, structure and task discipline as veterans tend to be. Another area that private support will bolster is the community-building Challenge Coin Initiative, which, in the tradition of military culture, enables NC State students to honor faculty and staff who have significantly impacted them. Continuing to grow and formalize the NC State Veterans Alumni Network, established in partnership with the NC State Alumni Association, into a self-sufficient group with strong leadership is also a goal. That network can be invaluable in providing advocacy, meaningful mentorship for students and even financial support for scholarships, Drake said. Military and Veteran Services is increasing its collaboration with advisers to support students who may be struggling, and hopes to deepen academic success and graduation recognition for military-affiliated students. Private funding also might support professional development for students, peer-to-peer networking including between veterans and ROTC members, and expansion goals such as a satellite office on Centennial Campus, additional staffing and a three-credit transition course for incoming undergraduate veterans. Drake sees ongoing opportunity, as well, in collaboration with partners like the NC Serves Network, managed by the USO; various area hiring events; and outreach and recruitment through community colleges and at North Carolina military installations in conjunction with the UNC System. Supporting veterans as they complete their education is a tremendous win-win, Wright said, because they already have strong life skills that can translate to success – something he experienced firsthand. Nick Drake chats with Dakota Lowery, a graduate student in the College of Natural Resources and one of 14 VA work-study students. After commissioning at NC State, he served on the California-based aircraft carrier USS Carl Vinson and destroyer USS John Young, and spent six months deployed as a surface warfare officer in the Persian Gulf at the end of Operation Desert Storm. Wright resigned his commission in 1996 and moved to Pennsylvania. He found that his naval background helped him quickly get interviews. After he landed a job as a junior portfolio manager with a hedge fund, skills honed in the military – discipline, leadership, drive, decisiveness and the ability to withstand pressure, manage risk, and analyze data and complex situations – helped him advance, he said. Eventually earning an MBA from the University of Southern California following a move to the San Francisco Bay area in the late 1990s, Wright enjoyed a successful career in investment banking. 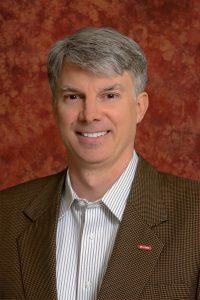 He has become more involved with his original alma mater since retiring in June 2015 as managing director at H.C. Wainwright & Co. Wright serves on the NC State University Foundation Board and the Poole College of Management Advisory Board and is a lifetime member of the Alumni Association. Once he heard Drake speak at an NC State athletics event, Wright knew that Military and Veteran Services was an area he wanted to support. “What Nick and the rest of the team are doing is really impressive,” he said. “That sense of community and unity in the military – if you can provide that to veterans and military-affiliated students while they get their degrees, that’s fantastic. You can make a difference for NC State's Military and Veteran Services program.